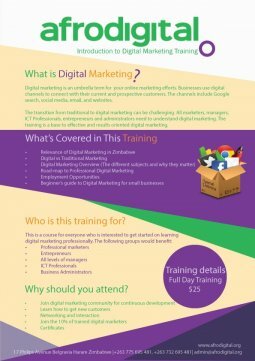 Do you want to learn about Professional Digital Marketing? Then attend our next training on 02 December 2017 – 9 am – 2 pm at Batanai Gardens. (Participants will have access to private continuous training and networking opportunities after this initial training. There are many other career and personal development courses right after this initial training). Join digital marketing community for continuous development. Learn how to get new customers using Digital Marketing skills from this training. Networking and interaction with the right people will always make you excel in digital marketing. Join the 10% of trained digital marketers in the world. Certificates prove your credibility to do the work.